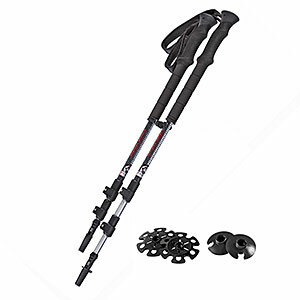 Great lightweight trekking poles for a bargain price. 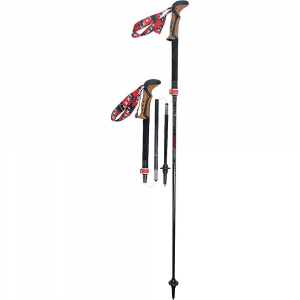 This is a review of the Yukon Charlie's Carbon Lite Trekker poles. They are listed on Yukon Charlie's website for around $70, but you can get them at Costco.com for only $49.99 (if you are a member). I have no connection to either company. Yukon Charlie's was not a familiar name to me, but I ordered these poles and they have been great. I have put over 200 miles on them in the High Sierra and southeast Appalachians, including using them to support my shelter, and have had no problems. These weigh in on my scale at 6.98 oz apiece, with straps. That's a lot lighter than many of the BD, Leki, Komperdell, and other brand names that cost twice as much. Yukon Charlie's lists these poles as 100% carbon fiber, with carbide tip. 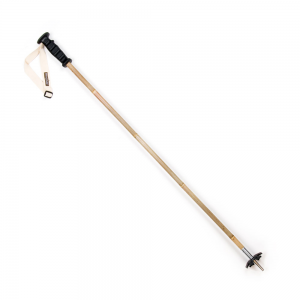 I have had more than a few occasions when I stumbled and threw my weight to one of the poles to the point that it flexed a little, I was afraid it would snap, but they have held up without fail. 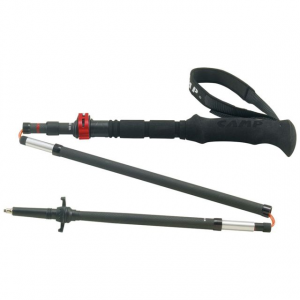 The 3-section pole is adjustable out to 135cm by using two flip-locks per pole. I know a lot of people don't like flip-locks, but these have never slipped on me and they work much better than twist-locks to adjust while propping up your shelter. And, no tools necessary — another knock on flip-locks is the need for a screwdriver head if the flip-lock gets too loose, but these poles have finger-tighten adjustment built in so super-easy and quick to adjust without tools if needed. These poles have EVA foam grips, molded grips at top and then extended down the pole for those who like to change grip positions. Straps are comfortable. Collapse to 24.5" for storage/shipping. Strap is adjustable and can be removed. Comes with two sets of baskets. EDIT 3/15: An update. After a few hundred miles one of the carbide tips had become shoved up into the housing. I chalked this up to normal wear and tear. I called the manufacturer just to ask if there was a way to repair or replace the tip, in response they sent me a brand new set of poles! Two poles to replace only one that had what I would consider normal wear and tear. So Kudos to Yukon Charlie's. In addition, last summer when hiking I snapped one of these poles. I can't really blame the pole or manufacturer, I was coming down a granite slope and planted the tip of one of the poles in a spot that was a slight depression shaped like a 'V', so it effectively held the tip in a hole, and I miscalculated when I swung my foot so that I ended up kicking the pole. So basically, if you can imagine a field goal kicker in a football game, that is exactly what I did to the bottom of my pole. It all happened in an instant and snapped the bottom several inches right off. This is one of the inherent disadvantages of carbon fiber poles. To the pole's credit, I continued using it, gingerly, for another 30 miles or so with no tip, including needing it to prop up my shelter, and it held up great. Thanks for the update on these poles, JRinGeorgia. 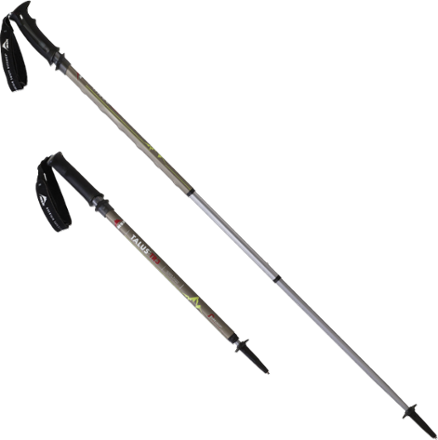 I used these poles for the first time for some light snowshoeing and the plastic tip split. There weren't any hard hits or anything, only normal use. I called to get the piece replaced and they said they couldn't replace it. Terrible customer service on an obviously defective plastic piece on the bottom of their pole. General use broke the tip of the pole on the first use. Customer service completely unhelpful in getting it fixed.